I've got a Eleksmaker 2.5W with an Mana SE 3.1 board. So far so good, it runs without any problem. Now, after spending some hours with the machine, I try to dialin some good settings for grayscale images. 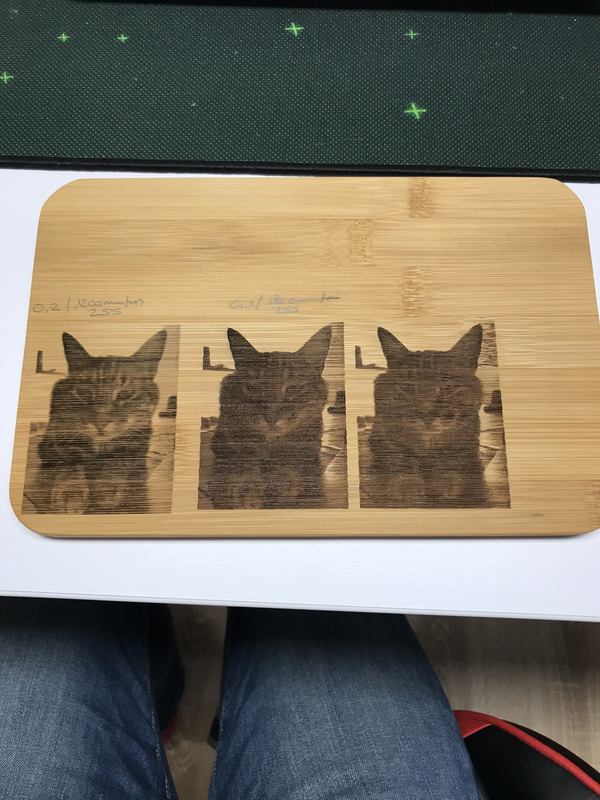 For this I took a random picture of my cat and did some burns on a cheap Ikea bamboo tablet. I did three passes: 1200/255, 1600/255 and 2100mm/min with 200 power. But it looks like the image is same dark in all three passes - except the quality is with 1200mm/min the best, sure, slower = better. Any tips and tricks for getting this better dialed in? You should see a huge difference between 1200 and 2100 engraving feed rate if you have the settings correct. Change the resolution to 0.2 for testing, this is lower quality but faster to see the changes. With 0.2mm and 1200mm/m I got the best result - 0.1 and 0.15mm are way to dark. But 0.2mm doesn't look really smooth... so my idea now, try 0.125 with lower power. @Benjamin-Schlageter Try 0.18 or 0.16, those are what I use with 2.5W laser. If you get slight banding at 0.18 you can de-focus a little to blend them and it will look fantastic. I thick some of the banding may be the grain of the material too, so you can't help that much, but diagonal engraving is worth a try. Yeah, I know and I think these Ikea Bamboo tablets are also ned the best one for engraving - even when I sand them down, they have a very uneven surface. But as they're cheap, it's wonderful for testing. As Zax mentioned, I think that might be because the grain structure of the Bamboo is causing the surface to burn at different rates. If the bands are still horizontal when engraved diagonally then it's likely the grain, if they follow the burn axis then it's more likely a hardware issue. As a trial have you tried a very plain (and cheap) wood like Lime or Bass wood? It's used a lot for carving so is available in some woody craft stores or on line. @DavidF Thanks for the tips with lime and bass wood. Never thought about it but I'll definitely search some - as you said, bamboo isn't the best for testing. I also noticed a lot of different results.